The Reapers Are the Angels is a well-crafted and unique first novel, detailing the life of Temple, a girl who finds herself alone in a world plagued by zombies. From a young age, she has fended for herself, learning the swift one-two knife stroke required to kill and keep dead a zombie before she even learns to read. She repeatedly rejects the company of other survivors in favor of solitude, in part because of her personality, and in part, we learn, because she is punishing herself for the evil she believes lives inside of her. As she grapples with questions that no teenager should have to face, let alone face alone, she longs for the days of sunny outdoor cafes, and holds a trip to Niagara Falls as her ultimate goal in life. She moves from a lonely island to a colony of hundreds of survivors to a camp of hunters to a train full of fugitives, but despite her efforts at loneliness, she is pursued by another survivor, aiming to settle a debt. In the end, the definition of friend and enemy is blurred, leaving Temple to determine what is good and what is not in a very grey-toned world. The Reapers Are the Angels offers a fresh voice in the zombie genre. The book, relatively light on plot but heavy on thought, stands out among a myriad of middling zombie currently books flooding the shelves of our bookstores. Though not at all lacking in the blood, guts and gore that are the standard of this genre, Bell takes a more philosophical - almost religious - look at human nature in the face of a zombie plague. How does a person react to a world turned upside down? Some surrender, some fight, some hide, some turn the other cheek, some pretend that all is perfectly normal. Some, like Temple, see the evil of the world reflected inside themselves. Despite the demons she carries around in her heart, Temple moves into the mind of the reader and makes herself a little home there. She is misguided, misunderstood, and miserable; though she doesn't seem to understand, the reader is privy to the fact that she is, in fact, a person with a good heart. Her story is powerful, despite the slow pace of the plot, as we see the world through her eyes and define it through her perspective. Above all else, Temple's story resonates with the nature of the world around her. Though cities - and civilization - have crumbled and fallen to dust, the beauty of the ocean, the sky, the forest, the trees, the world still remain, and that beauty, in a way, is Temple's beauty. Bottom Line: Bell's smooth writing, a narrative that reflects the inner voice of a troubled and determined young girl facing a world of zombies. 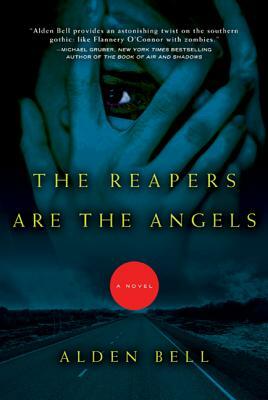 Although it ranks one among many zombie novels released in recent years, The Reapers Are the Angels is unique. The philosophical considerations of a zombie-infested world, the reflections on nature's persistent beauty in spite of the evil that strides across it, and the struggles of Temple as she looks for her place are not the standard markings of a zombie novel; paired with the guts and gore that one expects when killing the un-dead, this is sure to be enjoyed by zombie lovers and by those a bit skeptical of the genre to begin with. Note: I received a copy of this title for review from the publisher, Henry Holt.